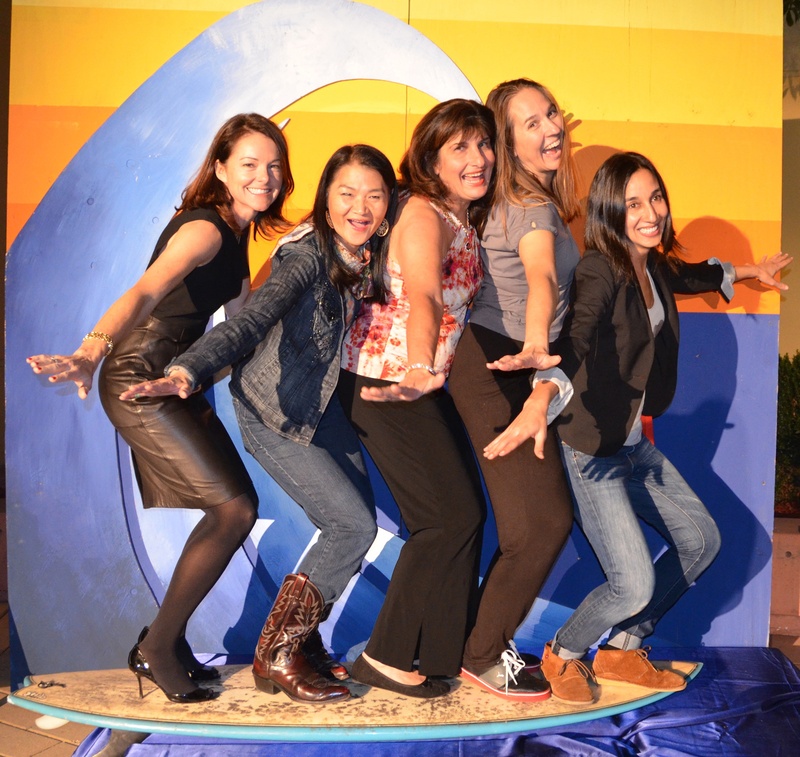 From Hollywood and Silicon Valley, to our beautiful beaches and forests, California’s diverse history, or the many artists who have called California home, this year’s Arts Night theme gave our teachers and students abundant inspiration for their artwork. 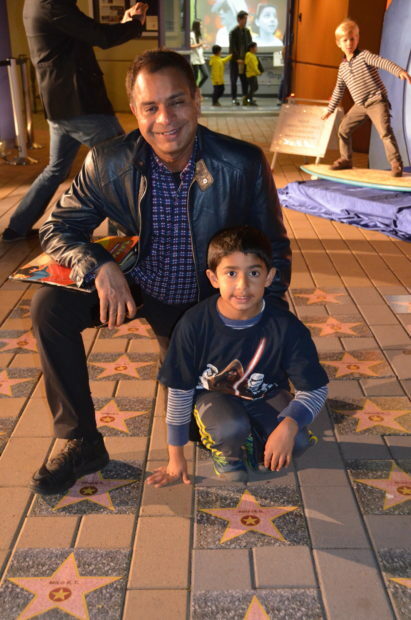 Each student had his or her own star on the ISTP walk of fame! 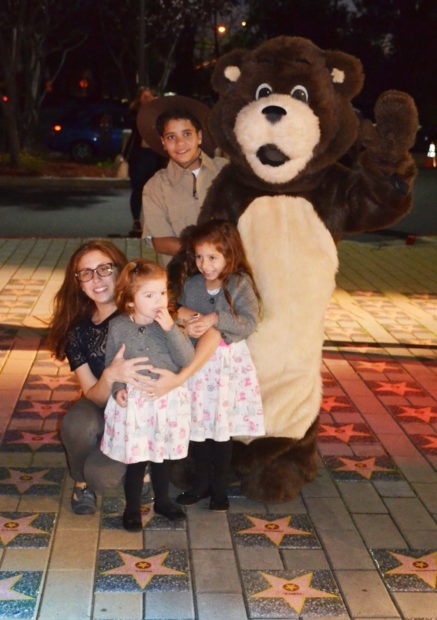 Approaching the school, guests were greeted by ISTP’s own version of Hollywood. 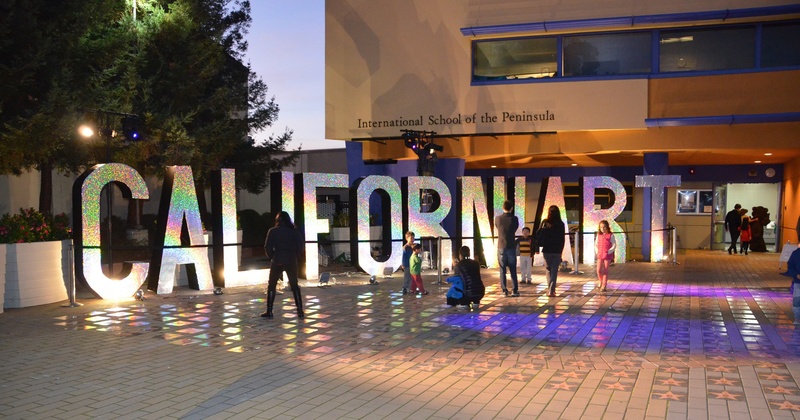 Iridescent, larger-than-life letters inspired by the iconic Hollywood sign spelled out “CaliforniART,” and an ISTP walk of fame gave students the chance to each find their own pink Hollywood star. Inside, several Middle School student projects drew from Silicon Valley’s spirit of innovation and combined art with technology. 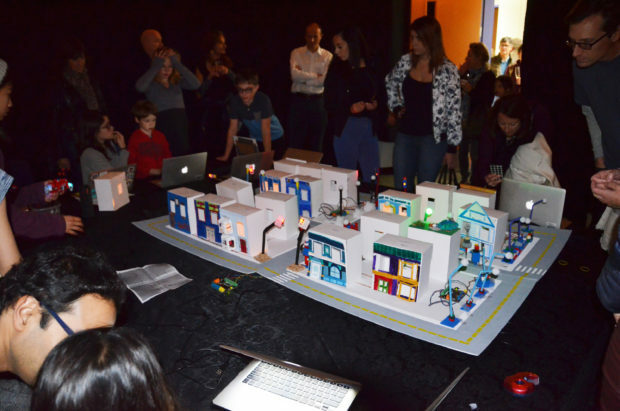 In 7th grade, students created a 3D model of the streets of San Francisco. They built robotic cars that drove the streets, and programmed streetlights to light up when they sensed that a car was coming close, using the Scratch programming language. They also built and programmed a windmill that would turn each time anyone tweeted #istpartsnight! 7th grade model of San Francisco streets, with robotic cars, streetlights with sensors, and a programmed moving windmill. In 6th grade, students wrote poems inspired by the mural art of the Bay Area, which they recorded as spoken-word poetry. Each student created a QR code that linked to his or her audio performance, and guests were able to scan and listen to the poems on their phones during Arts Night! Other innovative tech projects included making photo collages with Photoshop, and student-created videos. Kindergarten California desert ecosystem project. Another huge source of inspiration for student projects was the beauty of the California landscape. Students used many different media, including paint, ink, cloth, cardboard, clay, and more, to show the diverse natural beauty of our state. Nature-focused projects offered the opportunity to incorporate important lessons on ecology and conservation. 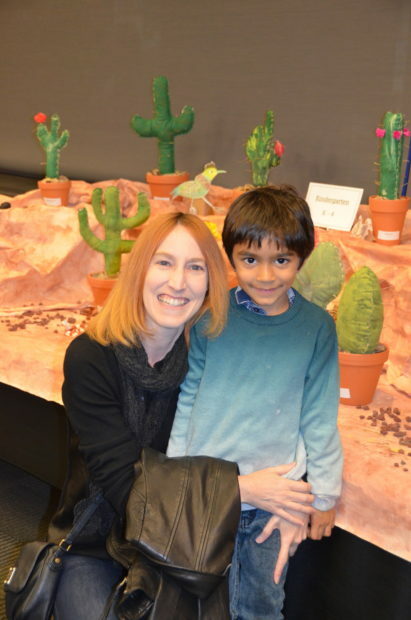 One Kindergarten class studied the ecosystem of the California desert, and recreated a desert scene with beautiful 3D cactuses and desert animals. Other classes studied California’s ocean and forest environments, or California’s many native animals, and made paintings inspired by what they learned. 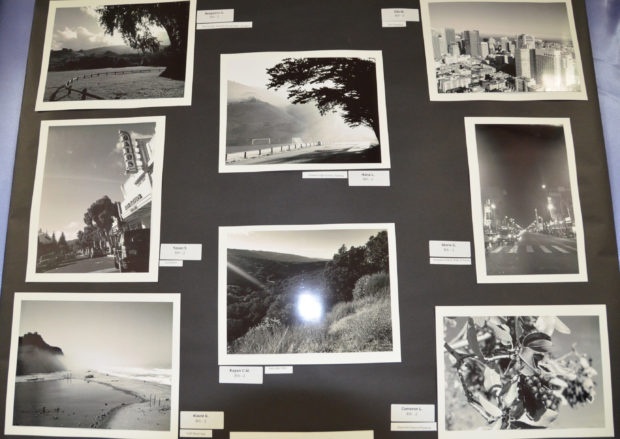 An 8th grade class did their own spectacular black and white nature photography in the style of Ansel Adams. 8th graders took photos inspired by the work of Ansel Adams. Other projects centered on California’s multicultural history. One Kindergarten class learned about the first trans-continental railroad, and the many Chinese immigrants who came to California to help build it, and then built their own railroad cars. Another class learned about Cesar Chavez, and collaborated on a large mural of his portrait. A 1st grade class learned about California’s Native Americans and made rock art in the style of the Chumash tribe. Many classes also based their projects off the work of the diverse artists who have called California home. Seeing all of California’s cultural riches reflected through our students’ art, one could not help but think about how much ISTP’s special learning community reflects our surroundings. We incorporate the innovation of Silicon Valley throughout our curriculum and in our computer science and design thinking programs; we help them learn to appreciate nature in our outdoor education trips and teach them about conservation and ecology in the classroom; we harness students’ creativity through inquiry-based learning and teach them how to be good citizens of the community in which they live. In addition to showing off our students’ work, Arts Night is also an incredible school event that gathers students, parents, grandparents, and alumni together, and reminds us that we are all part of the extended ISTP community. This special night would not be possible without the hardworking volunteers and teachers who transformed Cohn Campus into a wonderland of creativity. We would like to especially thank art teachers Haiying Yang and Aïcha Idelcadi, all of our Cowper Teachers, and Art Chair Jessica Yansouni and Food Chair Lisa Surwillo. Thank you!